You have sung of the unfathomable glory and goodness of God through the lyrics of “Indescribable,” one of the greatest worship hits in recent memory. Now take time to reflect even deeper on His majesty with the beautiful new Indescribable Coloring Book, based on the song that stayed on the Billboard chart for 34 weeks. Nominated for 2006 Worship Song of the Year and a blockbuster track on the 2005 Praise and Worship Album of the Year, the Dove Award–winning song “Indescribable” continues to inspire worshippers every day. 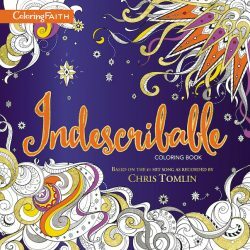 The Indescribable Coloring Book will be the perfect way to engage with one’s faith at an even deeper level. Full of stunning artwork to color, and worshipful song lyrics to restore your soul, the Indescribable Coloring Book is the perfect way to relax and spend meditative coloring time. Take time to color and reflect on the life-changing lyrics by Laura Story & Jesse Reeves. Try A Free Sample Coloring Page! Take Time Away from Your Busy Day to Reflect on the Simpler Life. Hey, y’all! Kick off yer boots and stay a while! Bless Your Heart Coloring Book will have you giggling as you color your way through the charming Southern sayings you know and love, with beautiful imagery that captures the spirit of the South.